As I write this, wildfires continue to rage in Northern California just 40 miles from where I sit. I feel the collective grief in the community right now. I feel the grief for the animal community that is being decimated by these fires. I feel the grief of pastoral systems and mixed woodlands that are being completely incinerated in this moment. I feel the grief for the human communities who’ve lost so much, their homes, their schools, their businesses, their belongings and their animal friends. What’s really the cause of these great disasters? Is it climate change? Is it the drought like fire officials are telling us? Can we just chalk it up to these issues that we feel we have no control over? Is there something bigger and greater taking place? Do we actually have the will, and the power to mitigate disasters like these? I think the biggest illusion that we are living in is how we think about these kinds of natural disasters. The California drought and wildfires are in many ways human induced to the scale that we are feeling them. Yes, I said it, the scale of these disasters are more human made than they are natural. Why is it human made? I’m not just talking about human influence of climate change, which clearly in my opinion is a major source of the macro pattern playing out on this planet and inducing natural disasters like these in California. That being said, it goes much beyond human made climate change. In short, it’s our mismanagement of our ecosystem that is to blame. 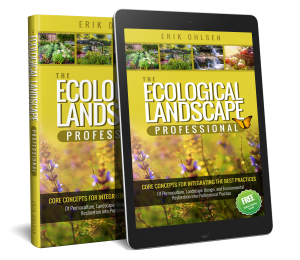 Over the last hundred plus years we have removed nearly all the management systems that evolved with our ecology. This is why they are suffering so much today. The management systems I’m talking about in part were activities of large animals such as elk, bear, and antelope. As well as Indigenous communities who were fully integrated in the health and functioning of the ecosystems in which they live through the use of fire and other methods. And fire, yes fire, one of ecology’s most powerful management tools has been missing from a positive relationship for a long time now. With fire being this amazing management tool how come we’re feeling total destruction from raging wildfires now? The answer to that question has everything to do with the state of our forests and our pastures. With the lack of large animals, management from indigenous communities, and the pattern of healthy fires, dead, dry and disease material of plants and trees has been left in the forests and on the pastures. This material we call “fuel load” and it is what is fueling these large fires so quickly. I think it’s interesting to note that this same material represents a large amount of carbon. As these wildfires rage they are releasing tons and tons of carbon into the atmosphere adding to the climate crisis. I bring this up because if these ecosystems were managed correctly, much of that material would actually turn into topsoil. This is just one connection between the drought and wildfires that nobody’s talking about. If this entire “fuel load” was stomped into the ground by large animals and managed in the way indigenous communities managed, much of it would be trapped now in the soil. That soil would have an ability to absorb and retain enormous amounts of water. In turn, these ecosystems would be less prone and more resistant to wildfires. This summer in California has marked one of the worst fire years in our history. Growing up in this state I remember the message of Smokey Bear. Smokey was always telling us “only you can prevent forest fires.” As Smokey Bear was ordered to the front lines to teach us all about keeping forest fires from starting, Humans decided it was safe to build huge communities in the midst of fire ecologies without taking responsibility for the necessary management of these fragile ecosystems. In fact, good old Smokey Bear may indeed need to take some responsibility for the massive catastrophes that California is now experiencing. It’s important to know that the California environment is what is called ”a fire ecology”. This means that our environment has evolved for tens of thousands of years with a relationship to fire. I don’t mean the kind of fires that are currently incinerating tens of thousands of acres as I write this. Not every fire is the same in the forest. The kinds of catastrophic fires that are happening now are called “crown fires”. Crown fires are when a fire which starts low to the ground finds fuel to carry itself up into the tops of trees. Usually using what are called “fire ladders” which are small dead trees and low dead branches on trees that give forest fires purchase to climb up to the top. Once a fire has reached the crown of a forest it becomes catastrophic. Crown fires are able to send embers or fireballs across entire valleys catching the crowns of nearby woodlands and spreading very fast. Since there is so much fuel in the crown fire, as it is burning entire forests down, the heat is very intense and also destroys living soil and all life in its path. For thousands of years there has been another kind of fire. These we would call low burning, low heat “healthy” fires. These are the kinds of fires indigenous communities utilized as part of their management tools. These fires burn out the understory removing disease, alkalinizing soil, and scarifying seeds of native plants that require fire to be viable. In the wake of a low burning healthy fire would be immense vegetative growth by pioneering plants that provides tons of food for wildlife. These fires would also create conditions for the larger and more mature forest ecosystems to flourish as disease was removed from the system and a more balanced soil pH was managed. In California, much of the native vegetation are considered fire ecology plants. Many plants like our native bunch grasses and many chaparrals will actually survive a fire. When a low healthy fire burns through it burns all top growth off but the deep roots survive in the soil waiting for the right time for the plants to reemerge again. This is a vital mechanism of the ecology since after fire season in California generally comes the rainy season. And with rain and surface water flow comes erosion. Many plants have adapted to be able to guard against eroding soil after fire. These high heat crown fires unfortunately can burn the roots out even of these deep bunch grasses and chaparral plants. What exactly did I mean by Smokey Bear has to take a little responsibility? Smokey taught us to smother all forest fires at all costs. To never let a fire burn in the forest. And because of our ability to smother small fires, the forests and the grasslands were able to build up enormous amount of “fuel load” that never got burned off in smaller fires or consumed by large animals that are now nonexistent in California. 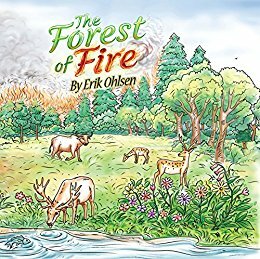 Now we have entire forest systems that are filled to the brim with congested and dying trees and with enormous amounts of dead and dry branches that are close to the ground creating fire ladders. If a fire ignites in the forest under these conditions it becomes a crown fire almost immediately. Years ago there was a study of fire patterns in San Diego and a similar size area in Mexico. Over a 25 year period the same amount of acreage was burned in both areas. The difference between the two areas was that in San Diego all the acreage was burned in one enormous fire. In Mexico the acreage was burned over a series of seven small fires over the 25 year period. Doesn’t take much to guess which fire pattern was more destructive. In that 25 years of suppressed fire in San Diego new developments and homes sprouted up which a catastrophic fire later endangered. As a professional ecological designer and consultant I see a lot of rural properties every year. And in temperate Northern California many of those properties sustain large mixed forests or large pastures dominated by annual European vegetation. Most of the time people are hiring me out to design them orchards or gardens, water management systems or landscapes. Often they’re not looking at the forest and the pastures the same way I am. Mind you, many of these folks are very ecologically conscious where I live and want to do the right thing on their properties but fuel load management never seems to be on their radar. Part of the problem is that the conservation-based environmental movement that sprang out of the 1970s has left a particular mindset around how we treat our wild lands. This mindset devalues the role of humans as managers. This approach is based on the idea that if we just leave nature alone completely she will heal all her own ailments. Now in an untouched and pristine ecosystem I can see how this would play out beautifully. Unfortunately much of the wild lands that we have today in California are not untouched and beautiful pristine ecosystems. In fact, they probably look like they are but if you look a bit deeper, and you do your research around what these places were like 100 years ago, you would find that they are missing some very important elements for health and resilience. Mainly what they are missing are the large animals to manage the carbon, and fuel load of these environments. They are missing healthy wildfires, and missing the wisdom and care of indigenous communities that evolved symbiotically with these ecosystems for tens of thousands of years. If you wonder what happened to all these animals, the majority of them were either hunted to extinction or devastated by the industrialization of human development. The indigenous communities were either eradicated by settlers (the great genocide no one talks about in Western culture) or kicked off their lands and held in reservations. Often when I walk on a client’s property and notice that their forests have an immense amount of fuel load I always bring this issue up first and foremost. I always make a strong case for the need for my clients to address the massive fuel load in their forests. Sometimes a client asks for an estimate to hire my company to do the work of managing that fuel load. Most of the time the cost of managing fuel load is too expensive for people to invest in. There’s always that mindset that “it probably won’t happen here” so why spend the thousands of dollars that it would take to manage these forests when what I really want to do is put in a nice edible landscape? I completely acknowledge and support people’s need to budget, and the fact that many folks don’t have any money to invest in this kind of work. This in my mind is the greatest obstacle to preventing raging wildfires like the one happening as I write this from happening again. We’ve let the forest go just too long without healthy relationship. The cleanup needed is enormous and the costs will be astronomical. Who is going to pay for it? 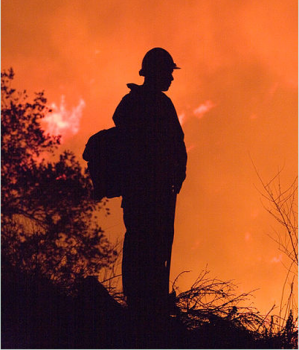 Here in California we have an amazing organization called Cal Fire. Over the last couple decades they’ve become much more understanding of these root causes and have successfully invested in fuel load management in some of the worst areas. The problem is that the forests are so massive and there is not enough funding to make a large enough dent in this. In retrospect, I think it’s a reflection of how our culture thinks. We won’t as societies invest in management tools that will mitigate forest fire no matter the extra benefits that we will get (sequestering carbon, building topsoil, reducing disease, alkalinizing soils, catching and retaining storm water, and mitigating destruction). We would rather invest in other things and then respond to the emergencies as they come. I wonder what the final monetary cost of these wildfires will be by the end of this year 2015? How many billions of dollars in lost infrastructure and lives will these wildfires create? Why are we as a society so shortsighted? Why can’t we invest in the things that will protect our future and provide resilience in our communities? In the end we’re going to pay for it anyway but it will be to the response of disaster, catastrophe and emergency and the need to rebuild once again. What do we do now? In this article so far I’ve only assessed some of the major problems that I see and the root causes of some of these human made natural disasters. It’s clear that many of these disasters we are experiencing today are the culmination of decades and decades of human industrialization and mismanagement. What are the solutions moving forward? Keep an eye out for part 2 of this article where I will detail techniques and solutions for turning fuel load into topsoil and water harvesting systems. I will talk about sustainable forest management and wildfire mitigation. If we want to have a future in California where our ecosystems are not incinerated, homes are not burning down around us, where our wells are not running dry, and our agricultural industries are not being devastated, then we need to rethink how we invest in California. And we need to do it now!